From the producers of the critically acclaimed 50th Anniversary Tour of Round the Horne comes another radio comedy classic live on stage. 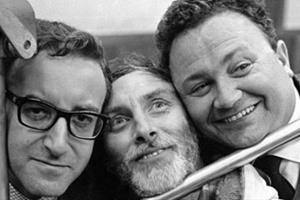 With its bizarre characters, fantastical plots and hilarious running jokes, The Goon Show captured the imagination of the British public and made household names of its three main stars; Spike Milligan, Peter Sellers and Harry Secombe. Now, Apollo Theatre Co. are proud to team up with Spike Milligan Productions to celebrate his centenary.